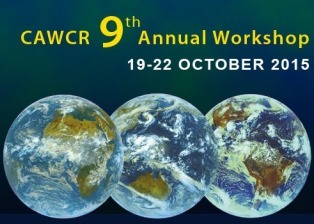 The Collaboration for Australian Weather and Climate Research (CAWCR) held its 9th Annual Workshop from the 19-22 October 2015 with a theme Coupled modelling and prediction: from weather to climate. The CAWCR workshop brought together Australian experts from the Bureau of Meteorology, CSIRO, the Universities and Research Centres, as well as a number of prominent overseas scientists. The workshop was held at the Bureau of Meteorology, 700 Collins Street, Melbourne. The 2015 workshop focussed on coupled modelling and prediction across weather and climate timescales, encompassing the key components of earth system modelling: the atmosphere, land, ocean, ice and chemistry. It addressed the status and prospects for improving our understanding, simulation and prediction of coupled processes, particularly as related to advancing our capability to predict high impact weather and climate. Greenhouse 2015 provided researchers, policymakers, industry representatives and communicators the opportunity to hear the very latest in Southern Hemisphere climate change science. The Conference provided a comprehensive update on the latest research findings and their practical applications, with a focus on Southern Ocean and Antarctic studies, and their implications for regional and global climate change.